The revisions reflect a deterioration in the main markets that Irish firms export to, particularly the UK due in large part to Brexit uncertainty and the euro area where the economic cycle has peaked sooner-than-expected. It also points to a softening in US growth in the short-term as the impact of fiscal stimulus there fades. Some domestic indicators have also moderated in recent months, it says. 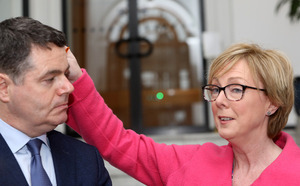 Posted in Misc and tagged Brexit, Growth, Paschal Donohoe at 5:11 pm on April 16, 2019 by Bodger. 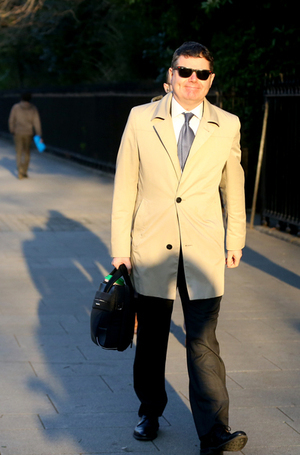 Minister for Finance Paschal Donohue heavily-disguised as an incompetent French detective heads toward a Brexit forum in Iveagh House. 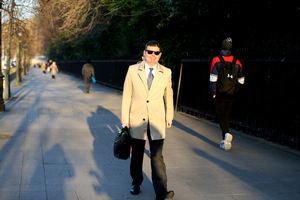 Posted in Misc and tagged Paschal Donohoe, Shades at 9:45 am on February 27, 2019 by Bodger. 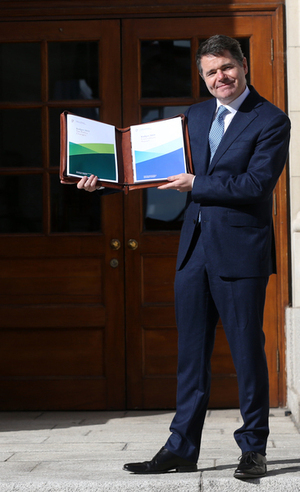 Minister for Finance Paschal Donohoe poses with his Budget 2019. 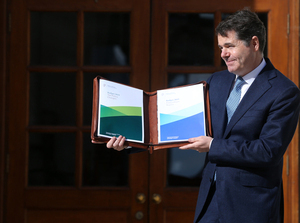 Mr Donohoe will deliver his budget to the Dáil at 1pm. He can be watched live in the video link above. 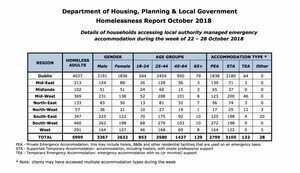 Fantastic announcements in #Budget19 for new housing. Does anyone remember exactly a year ago when govt announced €750m Home Building Finance Initiative to build 6,000 homes? No? Just as well, it’s delivered precisely nothing. Prepare your push alerts for this #budget19 bombshell: "Our 12.5% corporation tax rate will not be changing." 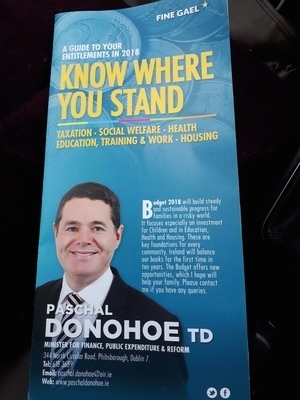 Posted in Misc and tagged Budget 2019, Paschal Donohoe at 12:47 pm on October 9, 2018 by Bodger. RTE’s News At One broadcast an interview Christopher McKevitt had recorded earlier with the Minister for Finance Paschal Donohoe. They discussed Permanent TSB’s plans to sell loans connected to 14,000 private homes in Ireland. 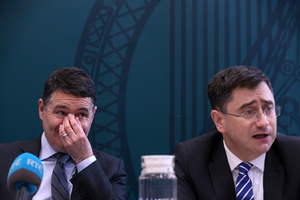 Donohoe: “And I would relate that back to all of the experiences that we have had over the last number of years in relation to Irish banking. We have a legal and regulatory framework in place that has been allowed and seen the amount of mortgage arrears in our country decrease very, very significantly so, for example, Permanent TSB has halved the mortgage arrears they have from around 33,000 cases to 16,000 cases. “We’ve managed to see this kind of change happen with a low level of home repossessions to date. And the reason why those things have happened is, as against the figures, which I’m deeply aware of, I’m also aware of the social cost and difficulties involved in this kind of change happening. “And that is why, as I look to deal with this matter, across the coming months, yes it is vital that we have a Permanent TSB that it’s in a long-term, stable and sustainable [inaudible] I want that to happen. We all need to see it happen. I also cannot be in a position that I’m interfering with how a Central Bank works. We put that behind us. McKevitt: “But yet you say Permanent TSB has done good work in reducing the number of loans in mortgage arrears. What’s the problem with continuing that work in much the same vein as they’re going? 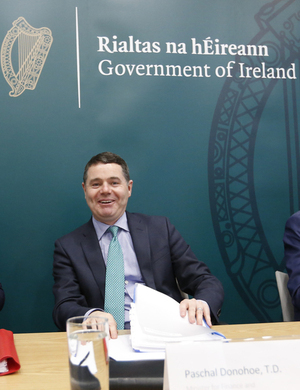 They’re talking about a sum of €3.7bn attached to 18,000 properties – 14,000 of those are private, principled dwelling homes for people who have families presumably, people who are embedded in their community, requiring schools and services. 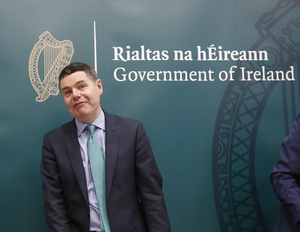 Donohoe: “With respect, I didn’t say that good work had happened here, because I’m conscious that as that work happened that it was also very difficult, it involved lots of difficult conversations with citizens. To answer your question directly about why they are required to do more, they’re required to do more because they’re non-performing loans, as a percentage of their balance sheet are at 28% which is five times the average across the Eurozone. “And I’m conscious as I say that to you Christopher and your listeners that they are figures against the worry that people feel today. But reducing those figures today is vital to ensuring that we have a stable and competitive banking system in the future, able to deal with the next difficulty that we might encounter. And what I will do in order to deal with the concerns that I know have been ignited by this announcement is I will look at the legal and regulatory framework that we have in place afresh. It will be an opportunity to do so as a minister for finance dealing with this matter. And I will be asking and consulting with the Central Bank for their further views on where they stand today. 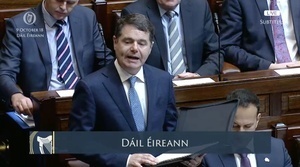 Donohoe: “And. 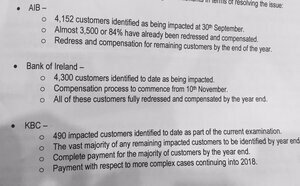 Permanent TSB have reduced their mortgage arrears by 43% versus the peak difficulties we were all in. So one of the points, they had 33,000 families that were affected by this, it’s now nearer 16,000. If you look at where we are, as an entire country, a few years ago, we had €54bn worth of loans that were classed as being non-performing loans – that figure is now €22bn so a journey has been made but for a bank in particular they still have a level of non-performance that is exceptionally high by either regulatory or European average. Donohoe: “Well, if I could break that into two different questions. Firstly, in terms of who will buy and what will be bought, I genuinely can’t answer that question today Christopher and the reason why is this process has not yet even begun to get into that area. 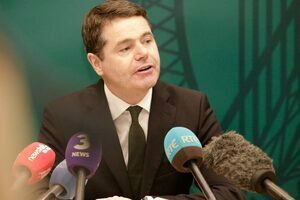 Donohoe: “And as against that, before I answer you question and tell you what I’m going to do about it. Against that, let’s just be cognisant of the journey that has occurred in relation to non-performing loans and banks within our country where we have a legal framework currently in place that has seen many of these difficulties evolve and be resolved without the mass home repossessions that did appear a prospect in our very very recent past. McKevitt: “Briefly, can we look at what Permanent TSB has told us about the portfolio, the Project Glas portfolio it’s selling. It’s loan values of around €3.7billion, 14,000 of them principled dwelling homes, they’re saying €1bn of the €3.7bn is investment properties and the remainder then is principled private homes. Of that, they’re saying close on €2bn worth of those loans with principled private properties are people who haven’t engaged with the banks for a number of years. Do you feel that the time has come for those people to leave those properties if they haven’t engaged, if they’ve no entitled to maintain the property that they’re in. 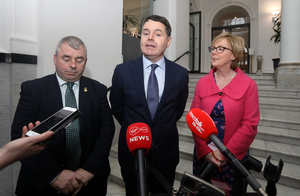 Donohoe: “The recent trend and what we have managed to deliver in our country of people staying within their homes while difficulties being resolved as fairly as possible I want to maintain. I am so conscious of, particularly with the housing difficulties that we have of the value and necessity of having a stable home, a roof over your head – these things are a vital part of what it is to be a citizen. And a member of our state at the moment. “In relation to the question that you have asked me about all of those loans, I want to maintain that approach but the answer is going to vary loan by loan and that is why I’m saying to you today that the legal framework that we have had replaced has been successful in staving off the kind of repossessions that many feared would happen and conscious of the concerns that have been ignited by this, I will look at that legal framework again. Posted in Misc and tagged Paschal Donohoe, Permanent TSB at 2:22 pm on February 21, 2018 by Bodger. 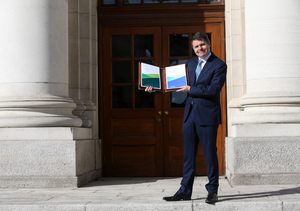 Freshly shorn Minister for Finance and Public Expenditure & Reform Paschal Donohoe briefing the media on the Annual Taxation Report. 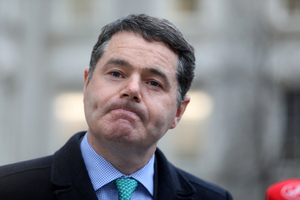 Posted in Misc and tagged hair, Paschal Donohoe at 4:47 pm on January 9, 2018 by Bodger. Came through the door in Dublin 7 this morning…Interesting timing! Posted in Misc and tagged Paschal Donohoe at 12:29 pm on November 27, 2017 by Bodger. Minister for Finance Paschal Donohoe (top) delivers the response by the five banks involved in the Tracker mortgage scandal (above). Guess we’d better take their word for it. Posted in Misc and tagged Paschal Donohoe, tracker at 5:14 pm on October 25, 2017 by Broadsheet. 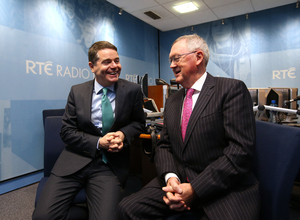 Minister for Finance, Public Expenditure and Reform Paschal Donohoe and Sean O’Rourke ahead of questions on Budget 2018 for the Today with Sean O’Rourke Show. 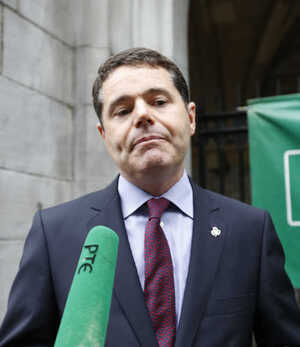 Posted in Misc and tagged Paschal Donohoe at 12:09 pm on October 11, 2017 by Broadsheet.